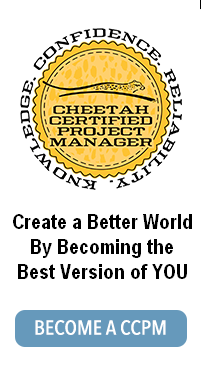 While Kristen and Miquette have been busy traversing the country running to save Cheetahs, Monica, Jean, Barb and I have been sponsoring PMI meetings, doing keynotes, running conference sessions, and generally having a great time with our project management compatriots around the world. In between meetings, I have been perfecting my pasta making skills. On this latest trip to the East Coast, we undertook a recipe that became an epic journey to create. This project started with Thomas Keller’s French Laundry Cookbook. For a week, this recipe for lobster with leeks and a beet juice reduction sat staring at me on my kitchen table from Mr. Keller’s book. It was a daunting recipe – it required steeping the lobsters, pulling all the meat out of a partially cooked lobster (no easy feat), and finishing it off by poaching it in this emulsified butter mixture. 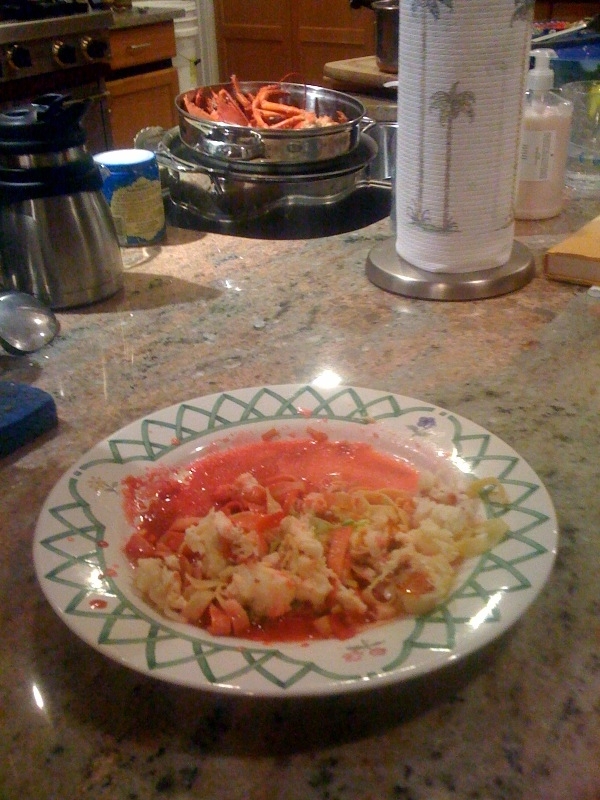 It required reducing a beet concoction to a thick syrup, blanching leeks, and a bunch of other steps we decided to skip. We also decided to skip the step to make an oven fried variety of potato chip as the starch and replace it with homemade pasta. I knew making this recipe would be a substantial effort. The Pasta – I have become quite the homemade pasta snob. Only the best and most fresh ingredients. This started quite by accident when I learned in Italy that pasta just required eggs and flour. As I noted in a previous post, inspired by the 100 mile challenge TV show, I have begun milling my own flour. I found a source for durham wheat berries – the type of wheat used in pasta. I now have enough durham wheat berries to make pasta for the next decade. Also, about three months ago, my right hand man, Kent, found free chickens on Craig’s list. These chickens produce a dozen or so eggs every day. I have an abundance of very fresh eggs. However, my chickens are in Nevada, right now, I am in Connecticut. My initial supply of durham wheat berries are also in Nevada. Since I frequent the east coast for the biz – I now have a ten years supply of durham wheat berries here and a source for fresh local eggs. To make the homemade pasta for tonight’s dinner, I had to start procuring the ingredients a week ago. Homemade pasta is now a several time a week staple at my dinners (with my travel schedule, I have become the traveling pasta maker – sometimes I have to use standard eggs and semolina flour – the bane of living out of a suitcase). So the pasta was really nothing special about this dinner, but it totally made this dish. This was the biggest pain in the neck pasta accompaniment I have ever made. Monica and I decided early on to take license with the Keller recipe – it was still quite a complex endeavor. Lobsters – this recipe called for steeping the lobsters just so they were partially cooked and then removing the meat. We are NEVER doing this again. Pre-cooked lobster meat, crab meat, halibut, sword fish, or shrimp can easily be substituted. This also called for making this butter emulsification. After hour two in the kitchen, we bagged that idea and just melted the butter, tossed in the partially cooked lobster meat and tossed in a bit of half and half – it was FANTASTIC. Leeks – clean very good, slice thin, toss in boiling water for a minute, strain and then put in ice. When ready to use on the pasta, take a bit of the lobster butter and cream in a small fry pan. Toss in the leeks and heat. Beet Juice Reduction – we were very worried about this as it was a stretch for us to consider this a good combo with the lobster. It was very easy to make (quite a different story with procuring the actual beet juice – we went to three health food stores before finding it). Mix all the ingredients in a sauce pan and reduce until a thick syrup. Then add the butter and let it melt into the sauce. Plating the food – put a tablespoon or two of the beet juice reduction on the plate. Then put the pasta. Next put a tablespoon or two of the leeks, and cover with the lobster butter cream mixture. Most of this is timing. The meat removal of the lobster was the longest time requirement. 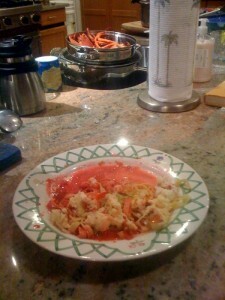 We waited until the lobster was poaching in the butter and cream mixture before tossing the pasta in the boiling water. While one of us was removing the meat from the lobster, the other was making the homemade pasta. No need to start with fresh lobster. You can get the lobster meat pre-cooked and this would be fantastic with any white fish, crab, or shrimp. The ingredients were fantastic together. The beet juice reduction gave the dish a nice touch without being overpowering. The lobster taste was the prominent feature with the other ingredients nice fresh accents. Maybe starting with the lobster live was worth it from a taste perspective. I am going to try this next with halibut. This entry was posted on Saturday, April 17th, 2010 at 7:23 pm	and is filed under recipes, Uncategorized. You can follow any responses to this entry through the RSS 2.0 feed. Both comments and pings are currently closed.